You would think that the trauma of the pigs and chickens would have put me off purchasing any more poultry pets for a while. 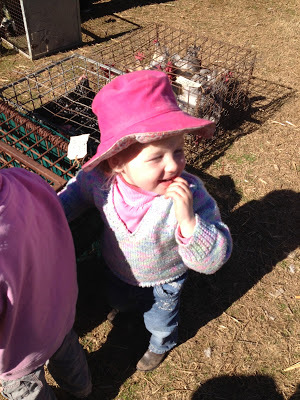 Alas no, our Muddy Puzzler turns the big 3 this week and she has put in a request for Ducks. All she wants when you ask is ‘A little Ducky’. 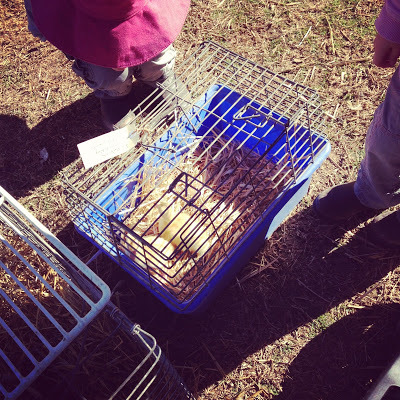 So Sunday we headed off to the big Poultry Auction. It’s held on the first Sunday of the month and has all manner of poultry available, Chooks, Roosters (hundreds), Special breeds of Chooks, Ducks, Guinea Fowl and yesterday one great big Turkey. We walked the Muddy Puzzler around and she pointed out what she would like, including a pair of ducklings and alarmingly the Big Turkey. Alas it was not to be, one pair of Ducks she liked went for over $200 and Muddy Hubby was the losing bidder on a few other pens, so we came home Duckless and Thank Goodness we also came home Turkeyless. 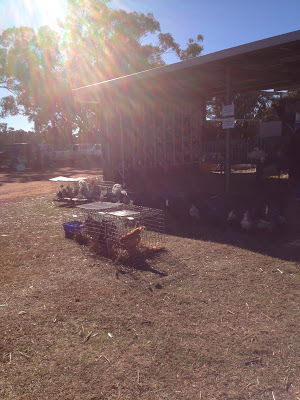 It was a fun day out though, a definite eye opener as people raced to out bid each other on what they obviously thought were prize Chooks. There’s a man on mystery at the auction each month, the rumor going around (which auction stalwarts were eager to share) was that this particular individual lives in a massive mansion in Sydney and earns a lot of money and each auction he puts on his daggiest clothes and buys up all the cheap roosters ($1-$2) and takes them back to Sydney. 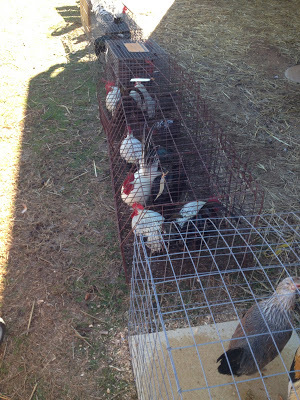 There is lots of speculation on what he does with them, including running rooster fights. My bet is on selling them at markets or pet stores, but the mystery still remains. Now the hunt is on for ducks before the big birthday arrives! Hanging Close by the Turkey! 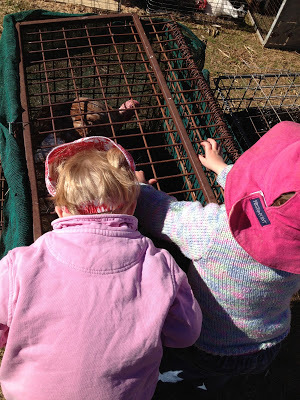 This entry was posted in Farm, Muddy Puzzler on August 5, 2012 by nat. What about the bloke buying cheap roosters!? It takes all sorts doesn’t it Nat!? How cute that your darling girl wants duckies for her birthday, I can’t say I blame her, they are so cute. If I didn’t think I’d get caught or in trouble, I’d pick up a few at Centennial in the next month or two, Spring time is massive for the trails of ducklings in the park. oh no not pork infused duck ! !